Just before the Halloween decorations were taken down and packed up, the signs advertising Christmas cakes went up. Bakeries, department stores and convenience stores all seem to have a corner for small cakes topped with whipped cream and tiny Santa Claus figurines. A traditional Japanese holiday feast of KFC and strawberry shortcake might come off as odd to those used to a whole roast turkey and apple pie, but if you’re up for joining the local festivities, then make sure your treats will impress. 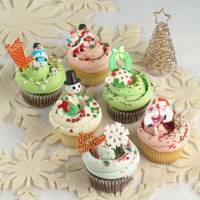 The most common types of Christmas cakes are sold at large bakery chains such as Fujiya. Strawberry shortcakes, topped with fresh strawberries and white chocolate stamped with the company’s Peko-chan mascot, come in three sizes: super small (¥2,100), small (¥3,000) and medium (¥4,000). The bakery sells other types of sweets for Christmas, but the most notable this year are the ice cream cakes, which come in two flavors: the Christmas Peko Ice Cream Cake (¥3,300), which contains a mix of strawberry and chocolate ice cream, or, for chocolate lovers, a chocolate ice cream cake (¥3,100) filled with two different types of chocolate ice cream. 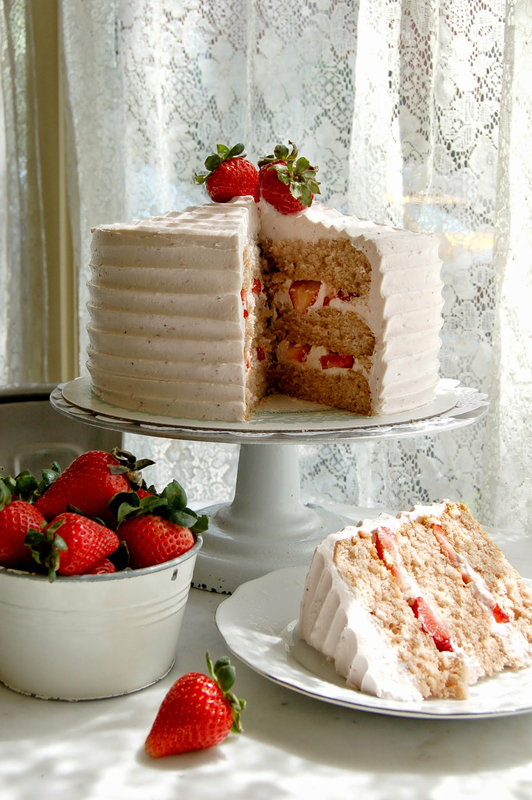 Like many bakeries that sell cakes for Christmas, customers have to go directly to the shop to place their order and then come back days later to pick up the cake. 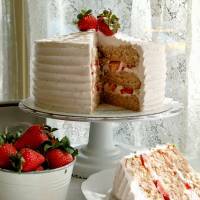 For Fujiya, the deadline for cake reservations is Dec. 16. Some people order their Christmas cake at a reputable bakery, but convenience stores also sell cakes that look pretty enough to display in a patisserie window. You can place an order at your nearest convenience store and pick it up by Christmas morning. Lawson, for example, has everything from simple strawberry shortcake (¥1,550) to chocolate-covered baumkuchen (¥1,700). Rival Seven-Eleven sells strawberry shortcakes in three sizes and also offers entire roast chickens (¥2,300), four different kinds of pizza and even champagne to wash that Christmas feast down. Customers can order the cakes online (www.7meal.jp/page/g/g03?a=a01) and choose the day they wish to pick up their goods. La Terre Patisserie in Setagaya (Ikejiri 3-27-10, Setagaya-ku; 03-5486-5489; www.laterre.com/patisserie) is selling tiny houses (¥4,320) this year made out of cookies reminiscent of the gingerbread houses children make during the holidays overseas. The houses come with a chocolate roof complete with a chimney topped with snow icing. A tiny Santa stands at the door, and inside you’ll find chocolate bonbons. La Terre only has 200 houses available on a first-come basis. Orders have to be placed online and the houses must be picked up directly at the bakery by Dec. 25. Typically Christmas in Japan is a couples’ holiday, but for the single folks out there who have no significant other to celebrate with, buying an entire cake for yourself is not too practical. Cupcake shop Magnolia Bakery (5-10-1 GYRE B1F, Jingumae, Shibuya-ku; 03-6450-5800), has a Christmas line running until Dec. 25 that features cupcakes topped with a generous dollop of icing and decorated with sprinkles, mini Santa Clauses and snowmen that are ¥480 each. You can also take home slices of their strawberry cake at ¥730 (the entire thing costs ¥7,300) or opt for a strawberry cupcake (¥530) instead. Of course, these cupcakes are addictive and one won’t be enough for one person over the holidays. Expect to end up taking an entire box home to last you until the new year, when you’ll have to start working on your 2015 goal weight. If you have a tighter budget, Mister Donut is also selling Christmas cupcakes in flavors such as strawberry, green tea and chocolate (all ¥194). If spongy shortcakes aren’t your thing, Cafe Accueil in Ebisu (1F Ebisu-Nishi 2-10-10, Shibuya-ku; 03-6821-8888; www.accueil.co.jp/index.html) is selling “doughnut pancakes” (¥1,630) — fried bits of pancake batter flavored with Canadian maple sugar. They come in a cardboard Santa sled and are served with a side of pistachio topped with whipped cream. The Zatta Bar & Lounge in the Hilton Hotel (6-2-6 Nishi-Shinjuku, Shinjuku-ku; 03-5324-8039) doesn’t have eggnog, but they do have Christmas cocktails that are just as good. You can try the “buche de Noel” (¥1,650), a boozy version of a Yule log made with rum and cherry liquor. Or you can try a frozen “Christmas shortcake” (¥1,650) that looks like a strawberry milkshake but is packed with chopped nuts, plenty of chocolate and hazelnut liqueur.